Delicious real. Fibre from 5 whole grains, oats, wheat, rice, corn and barley. With 9 vitamins and minerals. Source of calcium & vitamin D. No artificial colours of flavours. Suitable for vegetarians. Kosher.To produce 100g of this product we have used 77.2g of Whole Grain. What's the suggested portion size? 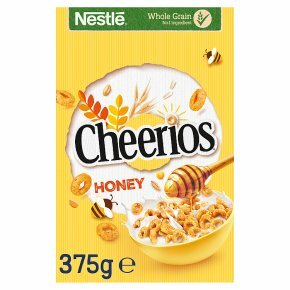 Kids 25-30g Adults 30-45g Enjoy a serving of Nestlé Cereals with the following items: 125ml Milk A glass of water 1 Fresh fruit 1 of 5-a-day Keep your Cheerios fresh! Roll down the bag and close carton after use.